The coat rack Nymphenburg by Otto Blümel through ClassiCon is a perfect representation of the mood of the period of its creation: 1908. Yet thanks to its streamlined elegance the ClassiCon wardrobe remains essentially contemporary. 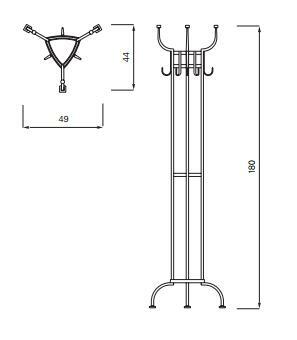 As a free-standing coat rack Nymphenburg provides hanging space for all manner of jackets, coats and scarves, while its nickel plated, brass bequeaths the ClassiCon Nymphenburg with a brilliant charm and makes it equally suitable for domestic situations as well as offices, public buildings, cafes, restaurants etc. The name thus perfectly embodies the design of the wardrobe: beautiful, timeless and powerful. Care For cleaning, a soft, damp cloth and a mild, neutral detergent are recommended.